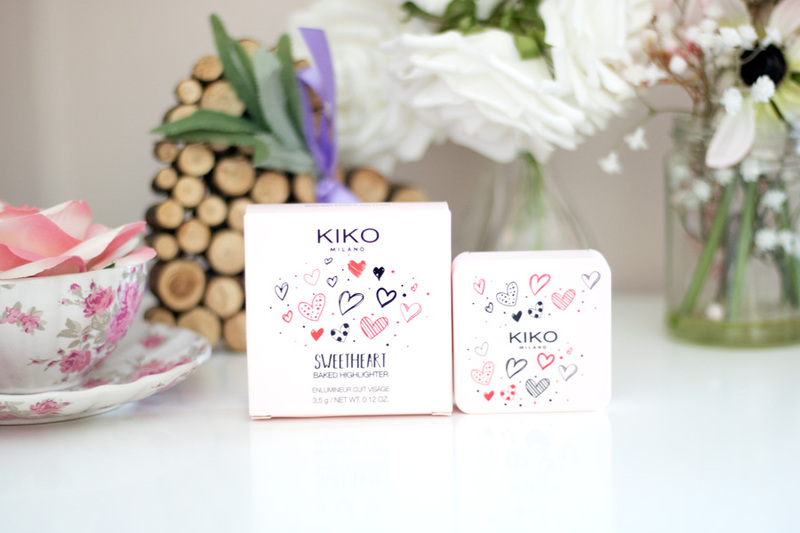 The Sweetheart collection was launched to celebrate Valentine's Day and designed to make you feel on top of the world as only love can. The collection consists of a baked highlighter, baked blush, an eyeshadow palette, lip liners, lip gloss and lipsticks. 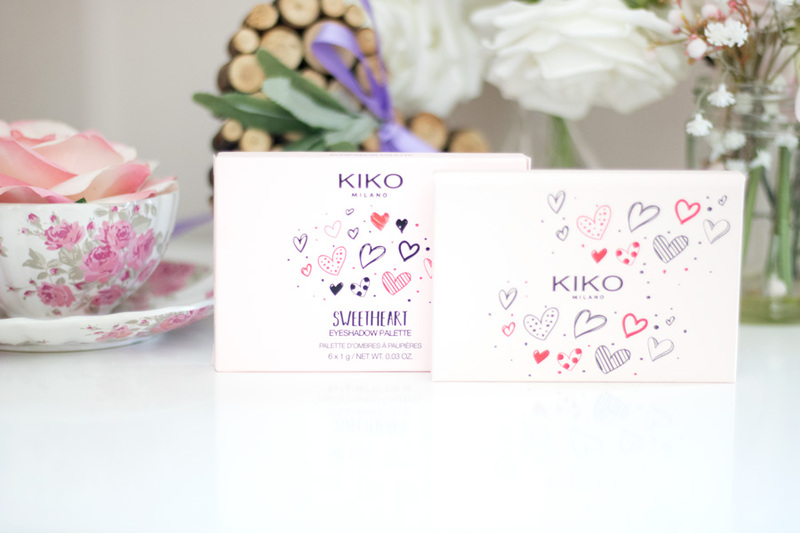 The products are enriched with the scent of forest fruits and it is so lovely. 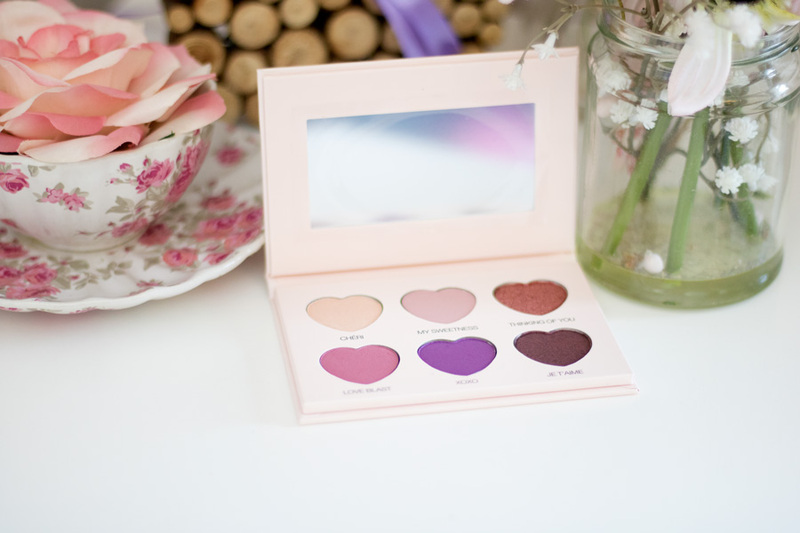 I personally think the shades chosen in this collection will suit a good range of complexions which is a plus for me. 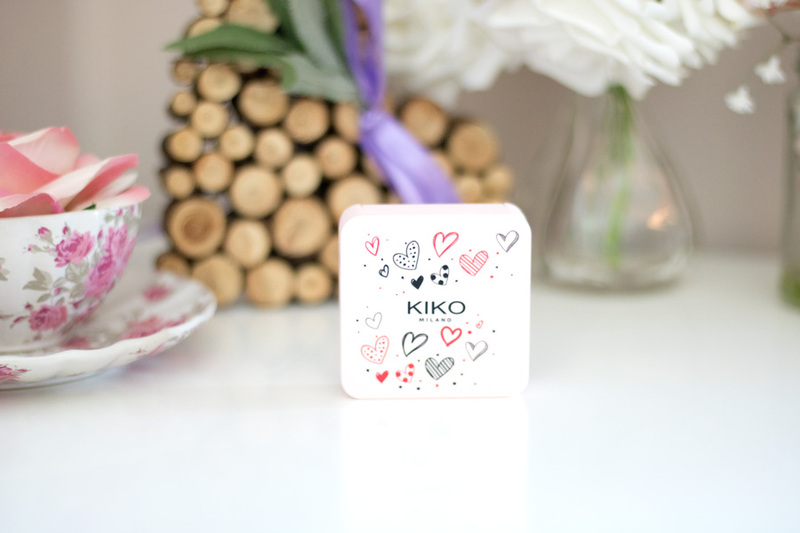 I really like the cute packaging complete with heart inscriptions all over it. 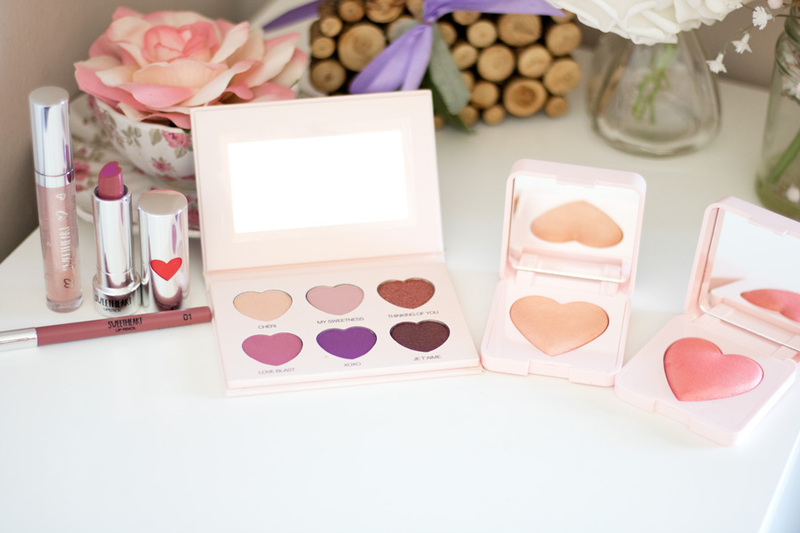 There are two shades to the packaging; the pink with hearts and red with hearts. The eyeshadow palette has a hard paper/cardboard packaging which I am not usually a fan of but this one seems to be good quality. 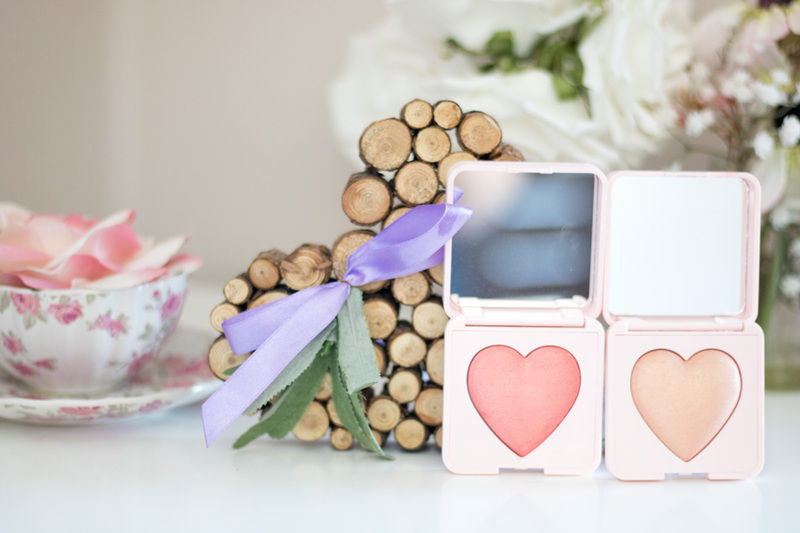 I love the lipstick bullet and the packaging of the baked highlighter and blush. 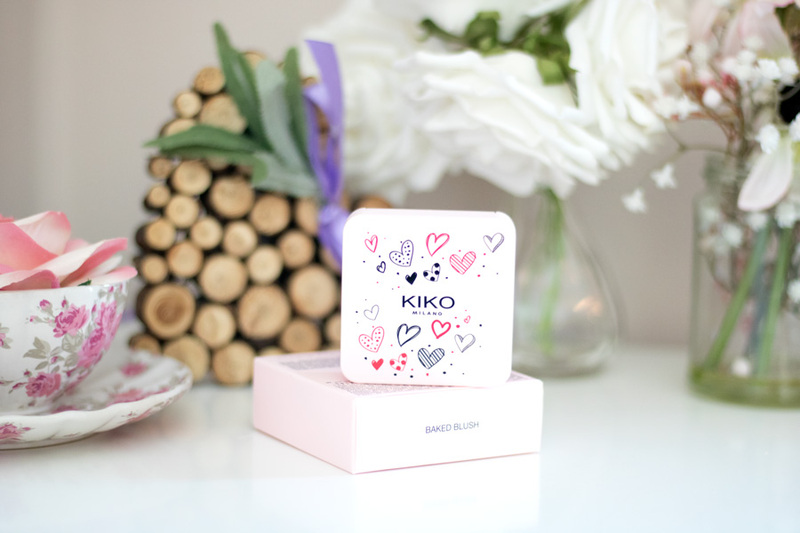 All in all, I think KIKO Milano did a great job with their packaging as they always do. 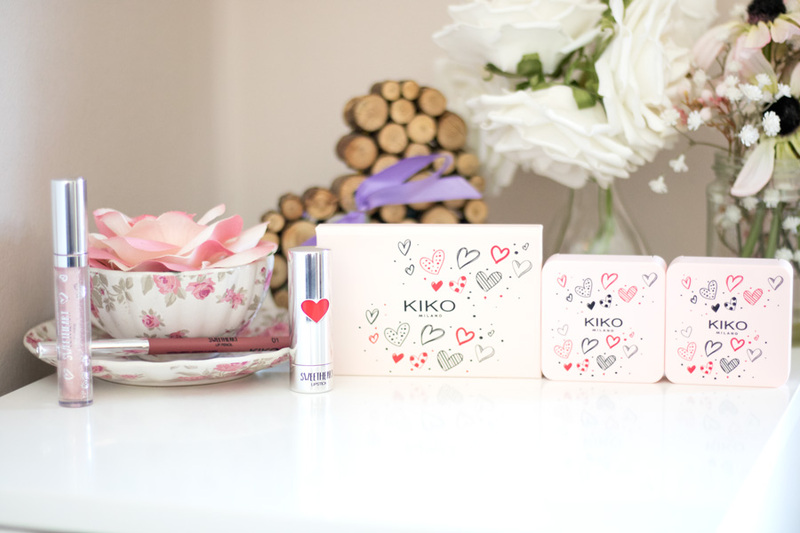 I have quite a few KIKO products and their packaging have lasted for a good while so I am expecting the same quality for this collection. 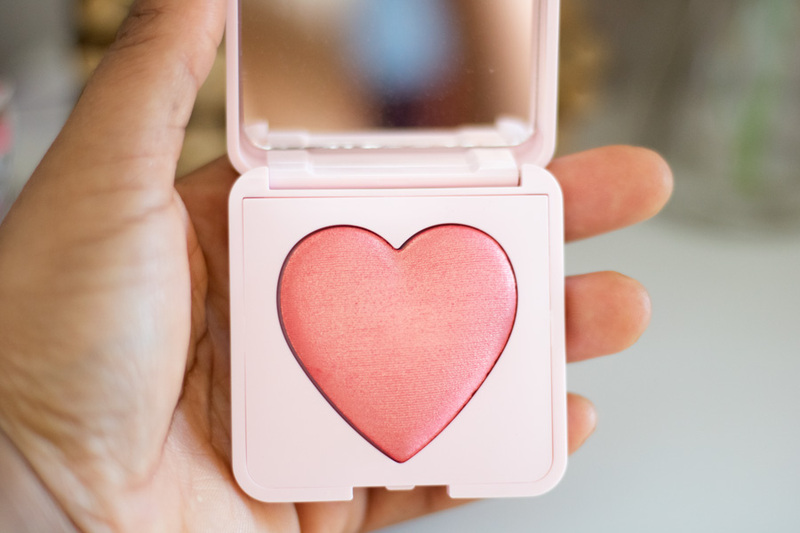 I generally love baked products so I had high hopes for this blush. 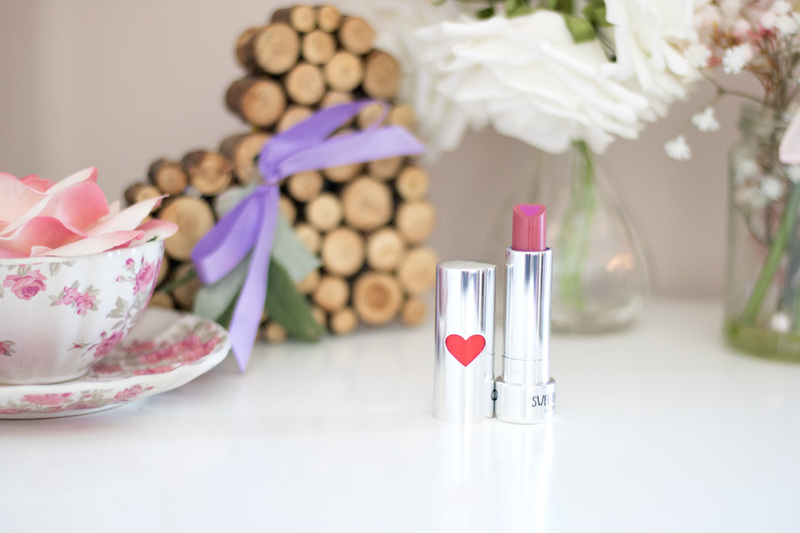 There is only one shade which is called Just like Coral and I totally adore the shade. 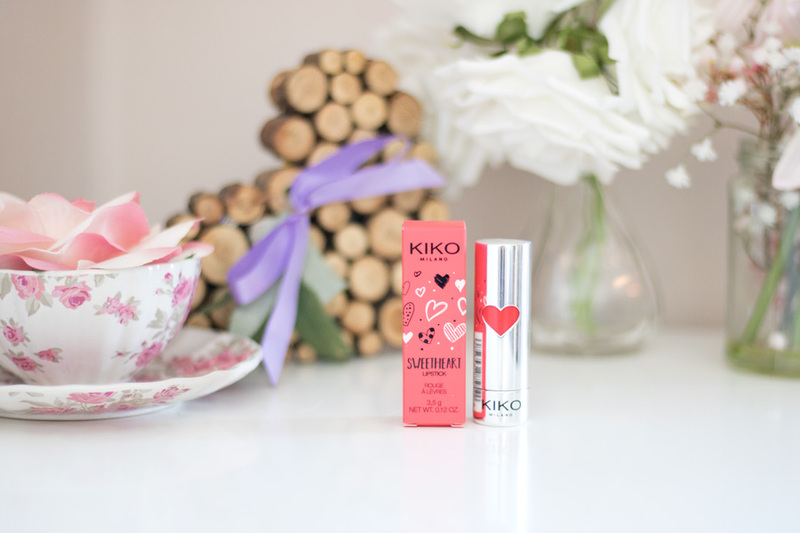 I feel it will suit many complexions because coral is one shade that just looks great on a variety of skin tones. It is very pigmented and I use a very light hand with and my Real Techniques Fan Brush works best for me. 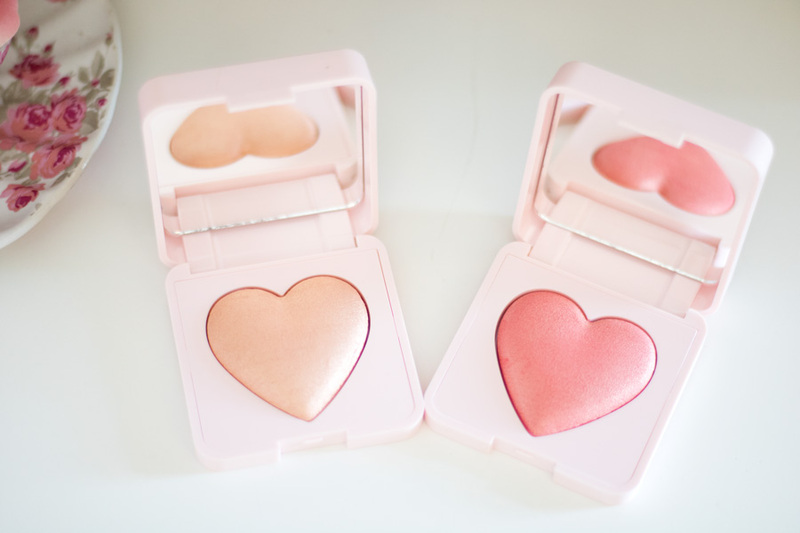 I use it both as a highlighter and a blush because it has a really nice natural glow. 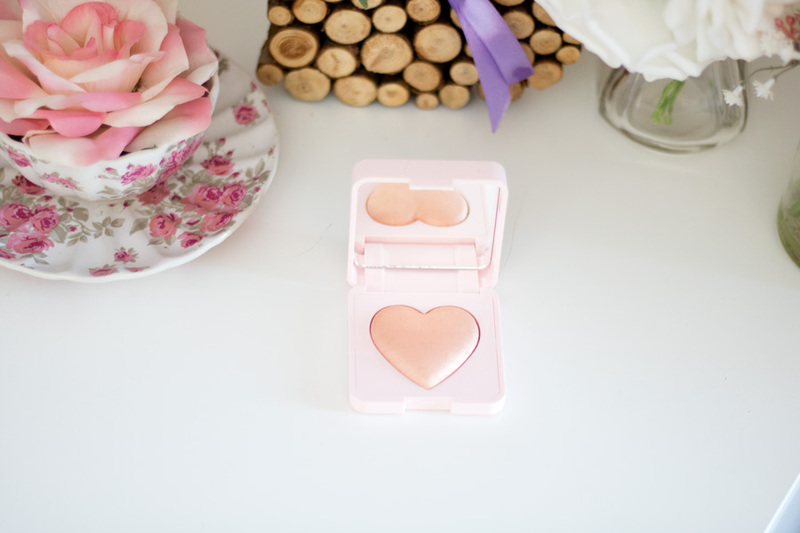 I adore the heart shape and the entire packaging because it's very cute and fits nicely in my makeup bag. For a night out, I feel it will fit well into any clutch. 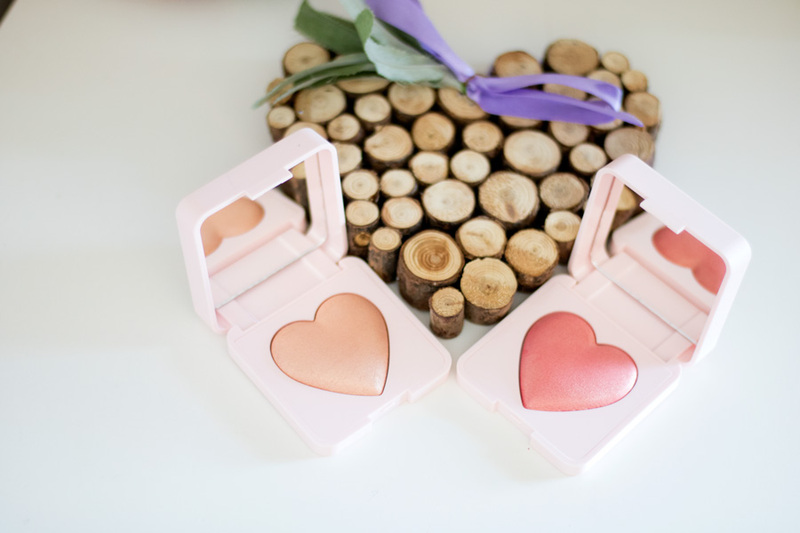 If you like a subtle touch of colour on the cheeks, this will be perfect and if you want to go all out, this blush will also work well because it is buildable. 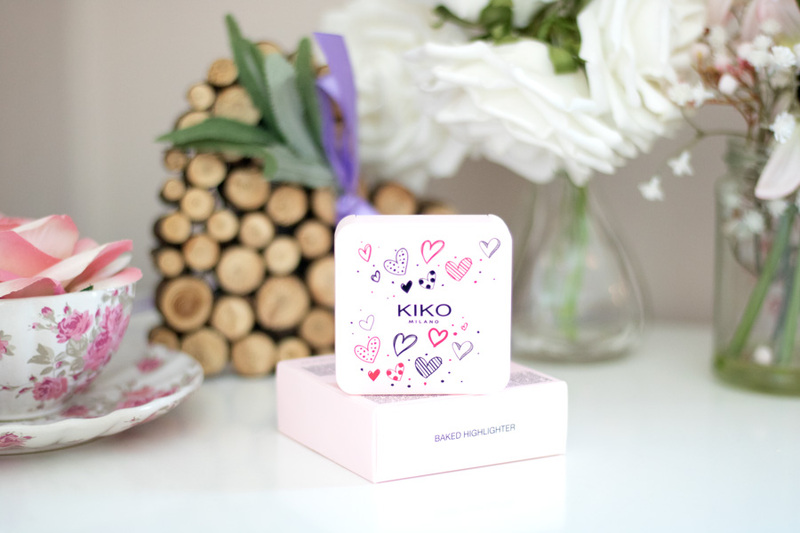 KIKO does really great highlighters so I knew that this will be an amazing product and I am happy to report that it did not let me down. 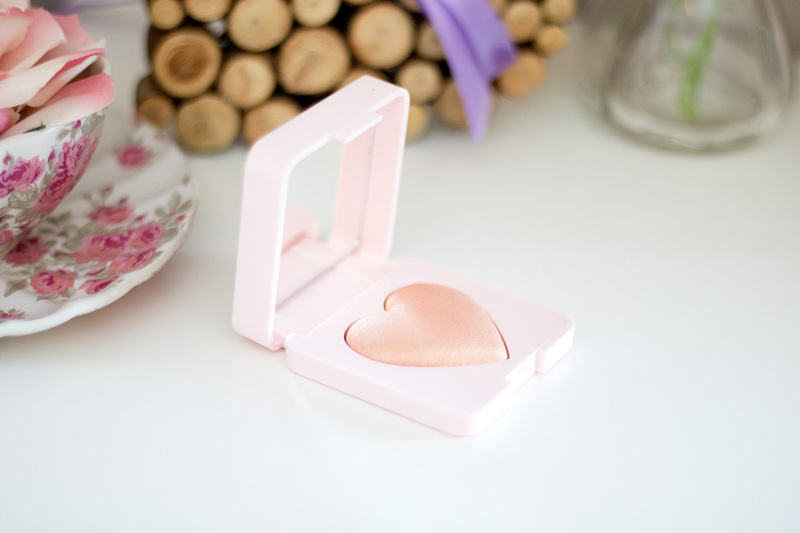 It comes in a similar packaging as the Baked Blush and has the same smooth, velvety texture which I really like. 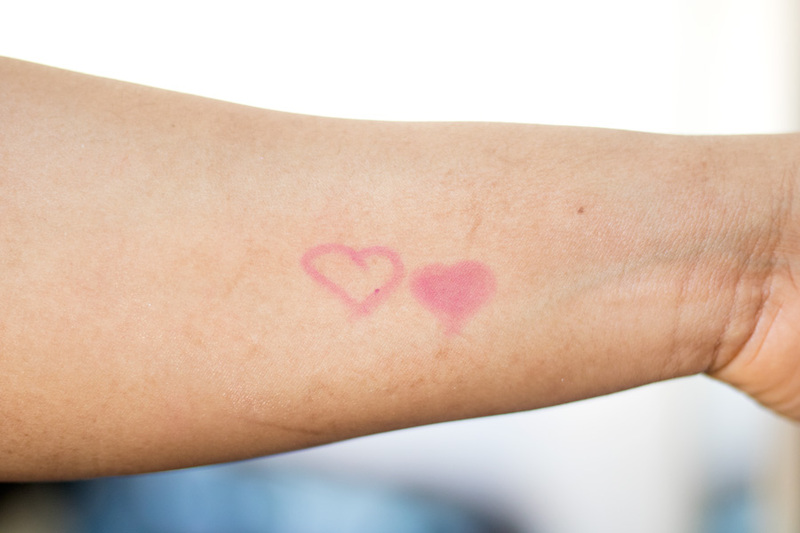 It does not have a film across it that prevents you from getting the product and I find some highlighters doing this after a few uses. I have used this quite a few times and I can tell the texture will remain true till I hit pan. It is equally pigmented and I love this shade of gold because it is wearable. It is not too yellow or pale but just sits right in the middle which makes me believe many people will enjoy using it. 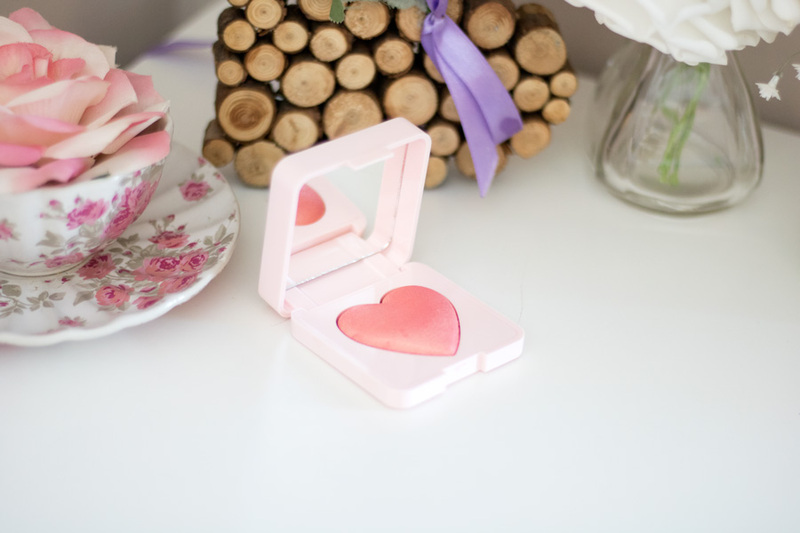 Just like the blush, it can be built up so if you are out to slay all the way, you can just pack it on. 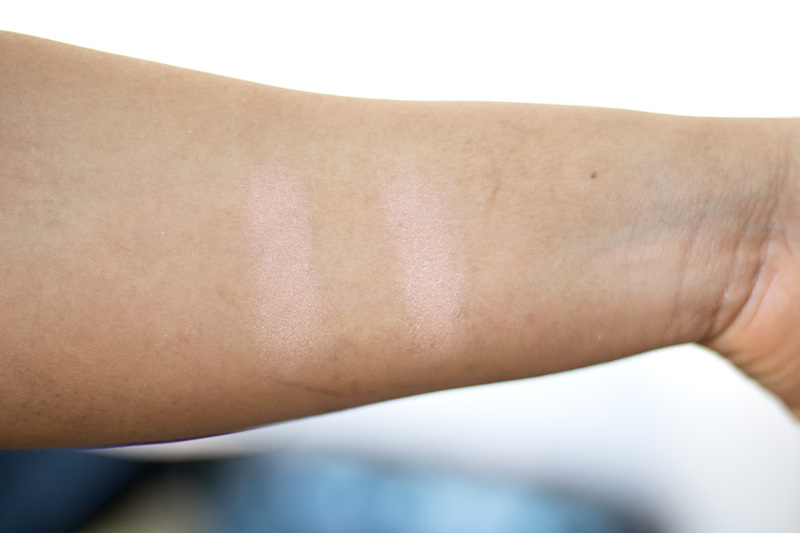 I prefer a subtle glow so I just use a light sweep of my same Real Techniques Fan Brush which really packs and distributes the right amount of product where I need it. 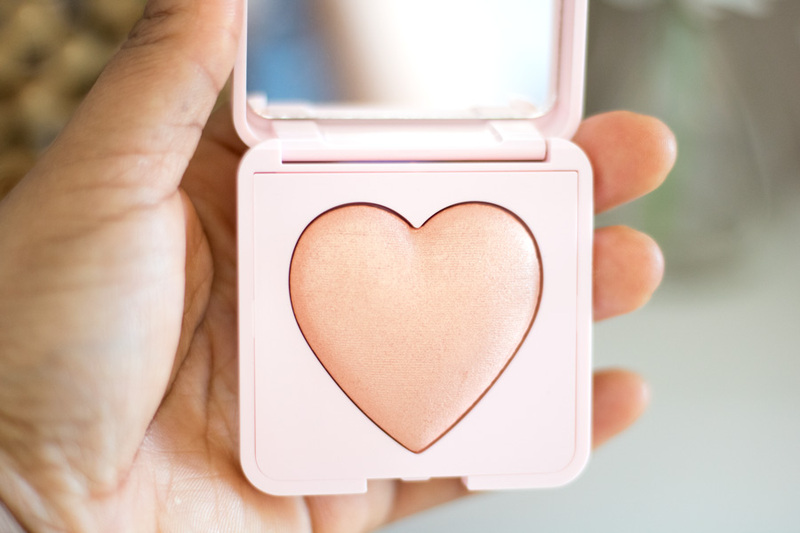 I can't fault this highlighter at all and I have been wearing it every chance I get. 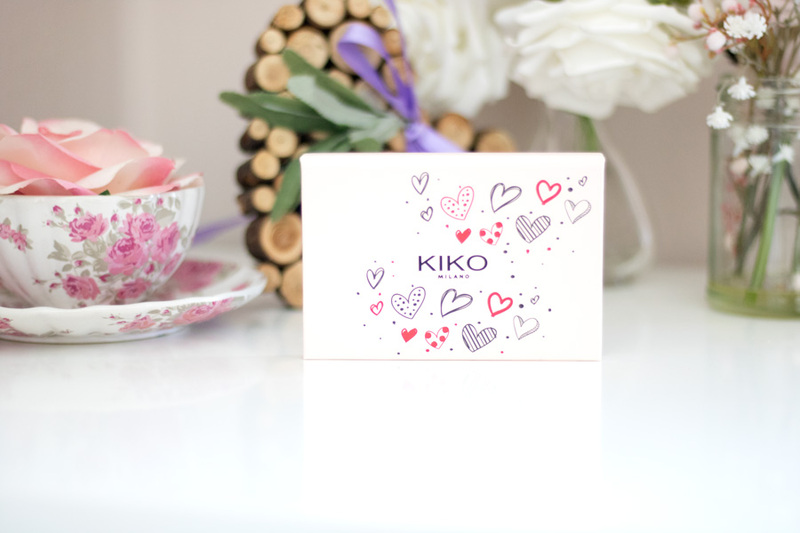 I have a large collection of KIKO Eyeshadows which I have customised into palettes and quads because they make amazing and affordable eyeshadows. I don't think I have any pre-made eyeshadow palette so I was excited to try one and see if the quality was the same as others I own. 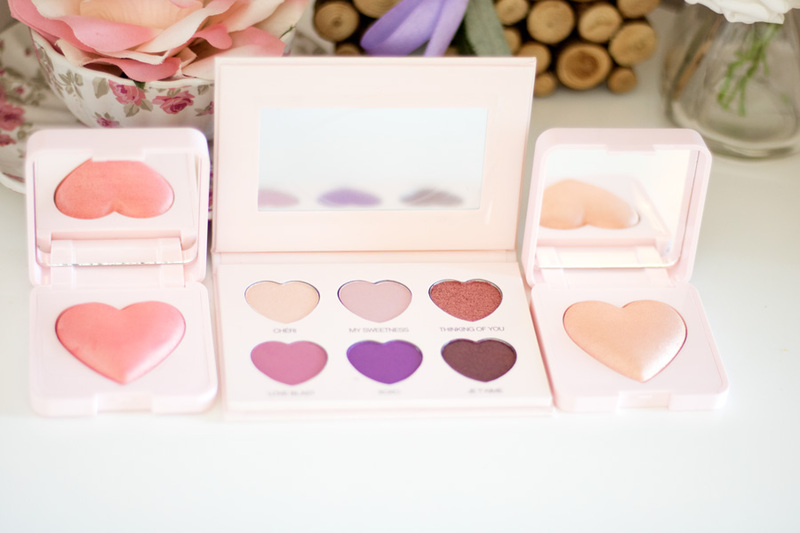 The Sweetheart Eyeshadow Palette contains 6 eyeshadows which are heart shaped in the cutest palette packaging. It is made from hard cardboard/paper with a magnetic lid and a mirror. It is really slim and travel friendly. 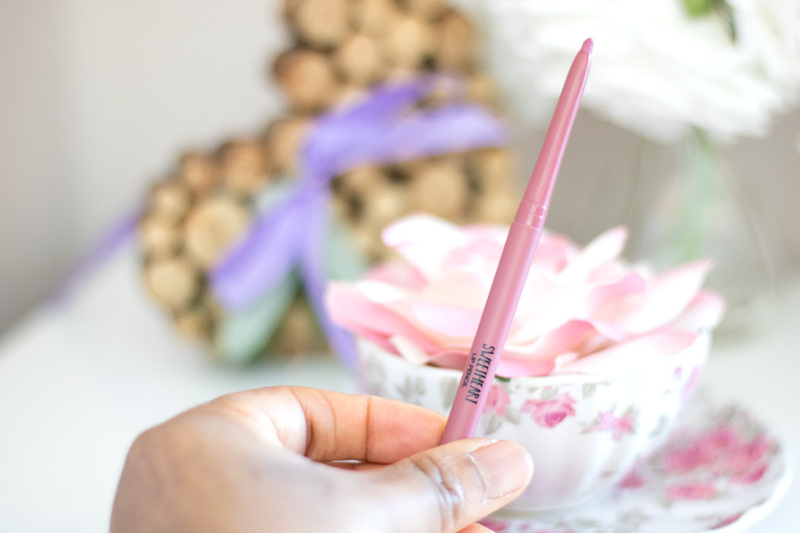 I actually traveled with it to London and there was no mess or damage which is great. I do tend to prefer eyeshadow palettes made from plastic because they are easier to clean and more durable but so far this has been fine. 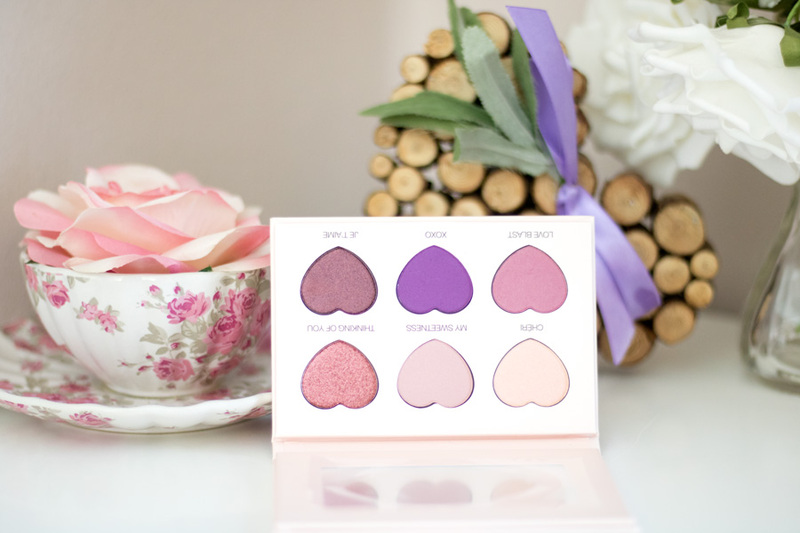 The six eyeshadows are: Cheri, My Sweetness, Thinking of You, Love Blast, XOXO and Je T'Aime which are all lovey-dovey names. 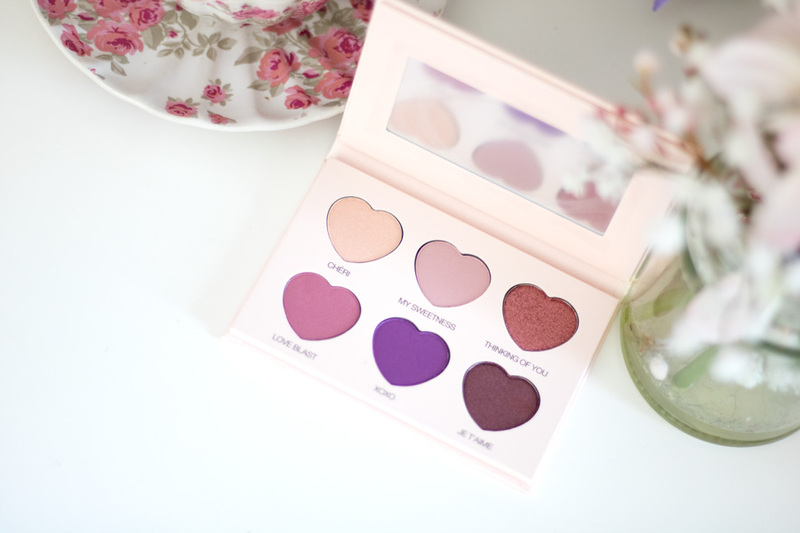 The palette has a mixture of matte and shimmer shades which I like because it means I can create a complete eyeshadow look with it. 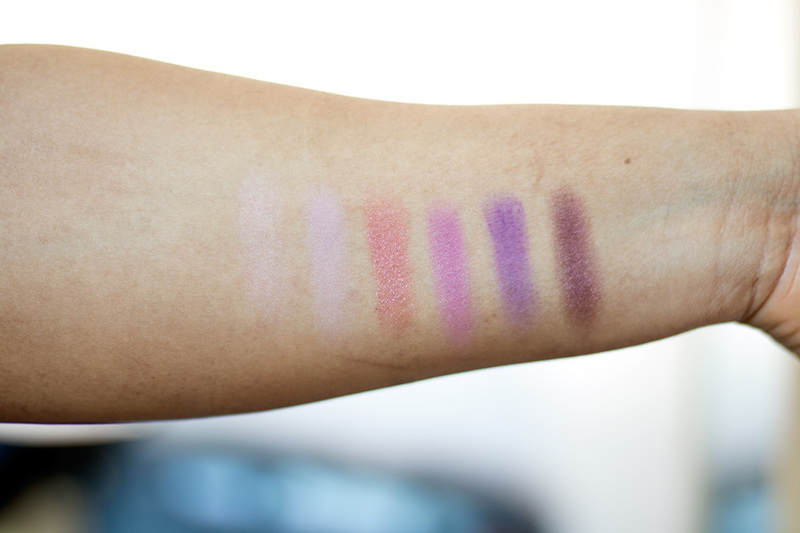 Cheri and My Sweetness don't have the best pigmentation on my complexion so I do have to build it up however the other four shades are just marvelous. 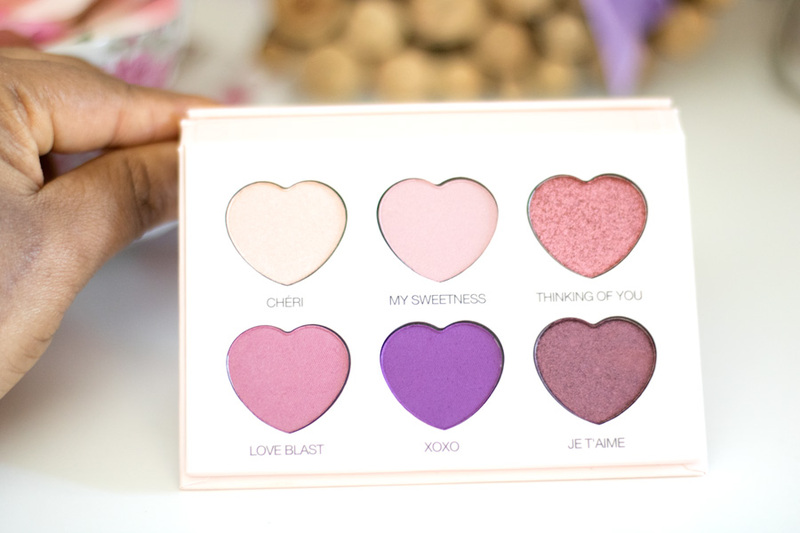 I use Love Blast and XOXO on my crease while Thinking of You and Je T'Aime are for my lids. I use Cheri as a brow bone highlight and it works well. 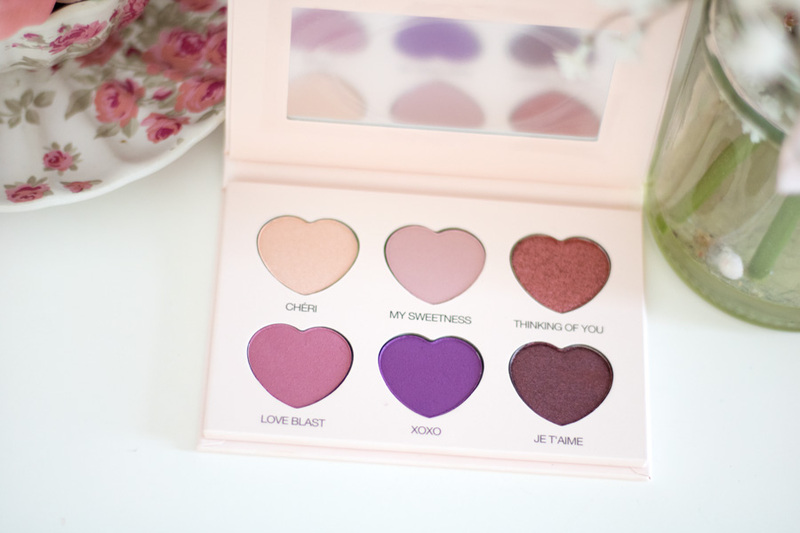 I am so pleased there are warm shades in this palette. 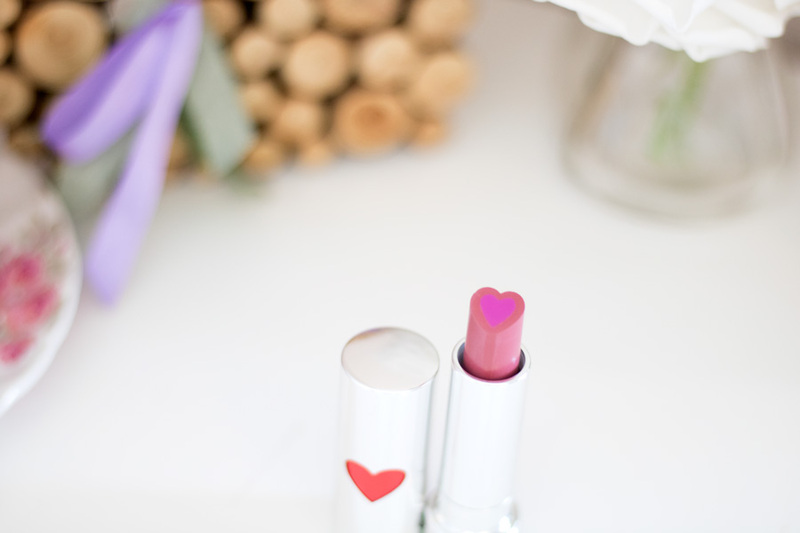 Isn't this the cutest lipstick ever? I definitely let out a squeal when I first unboxed this lipstick. 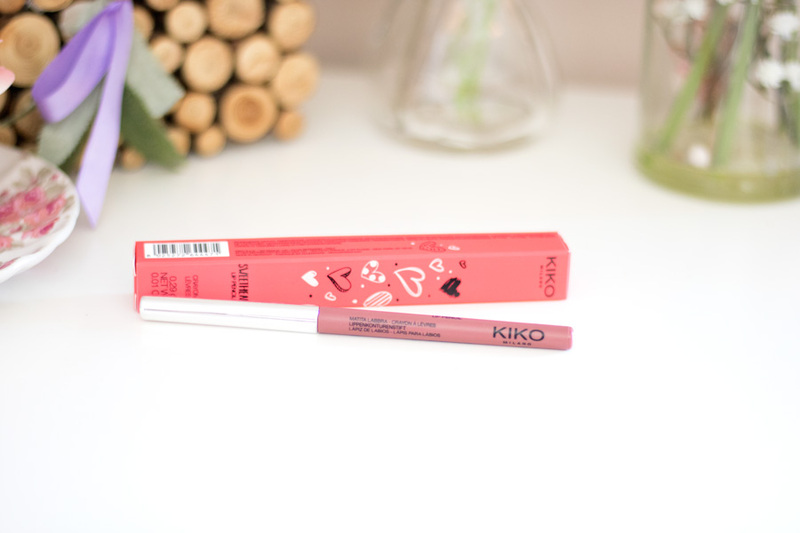 KIKO describe it as a two-toned creamy and shiny lipstick and I can't think of a more apt description. 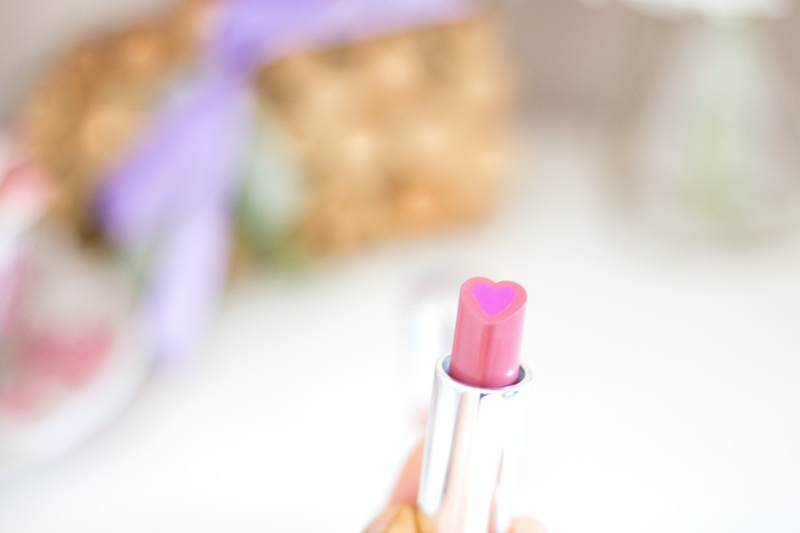 There are 6 shades and I have the shade 01 Kiss from a Rose which suits my complexion so perfectly. 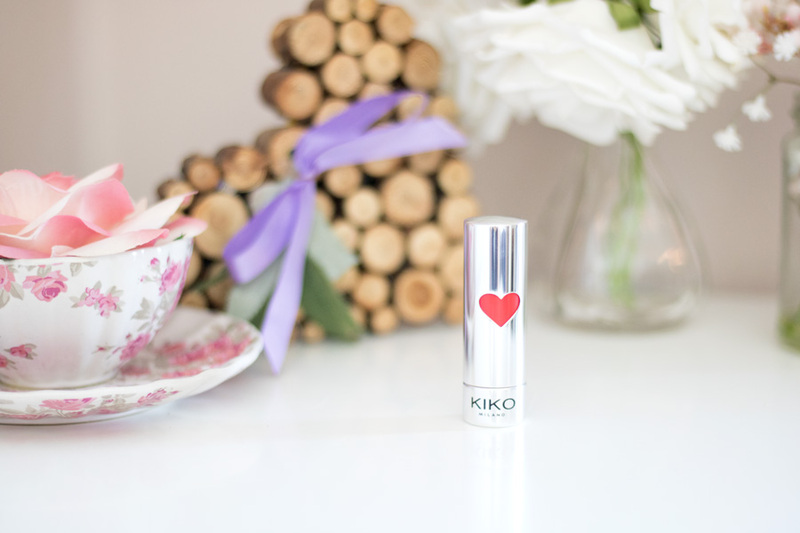 The lipstick bullet looks so classy with a heart inscription while the lipstick bullet has a heart within the design. 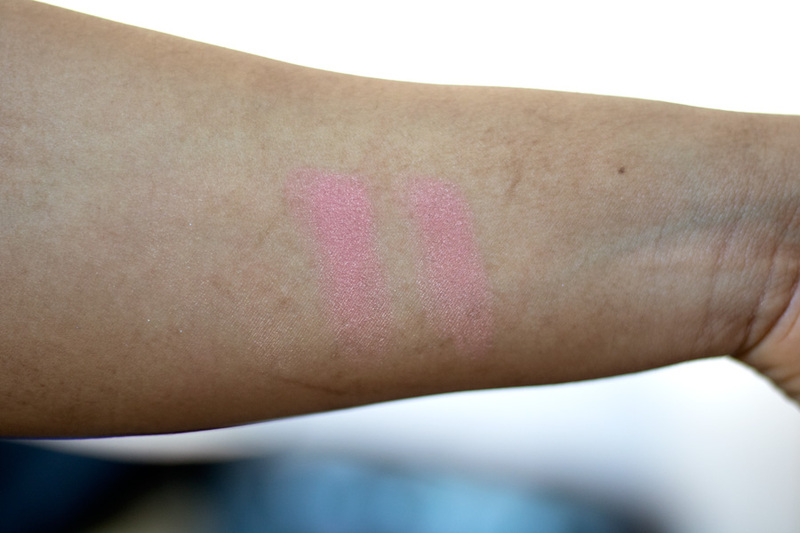 There are two tones as you can already tell from the picture (ignore my silly swatch) and together, they create a seamless lovely shade on the lip. 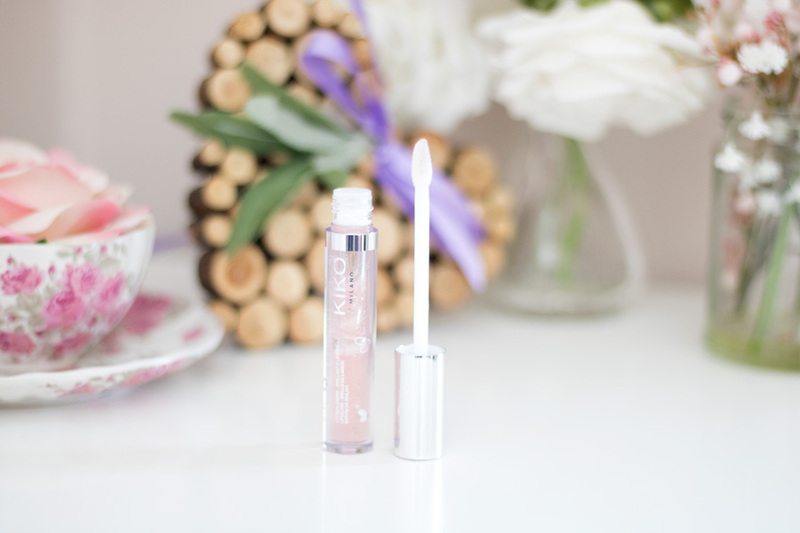 I love the texture as it is moisturising, long lasting and perfect for this weather which has my lips feeling dry. It feels lightweight and non-greasy so I don't get my hair sticking to my lips when the wind gets out of hand over here in Scotland. 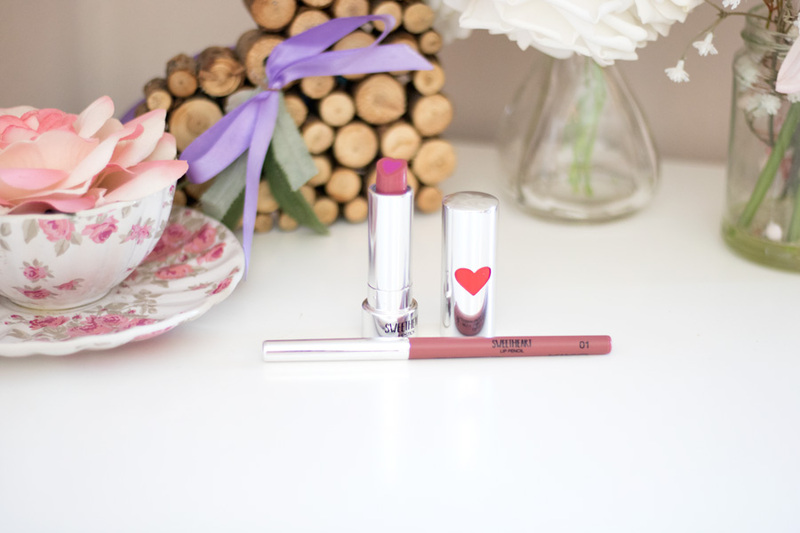 It's such a lovely lipstick and a perfect addition to my collection as I don't have anything like it at all. 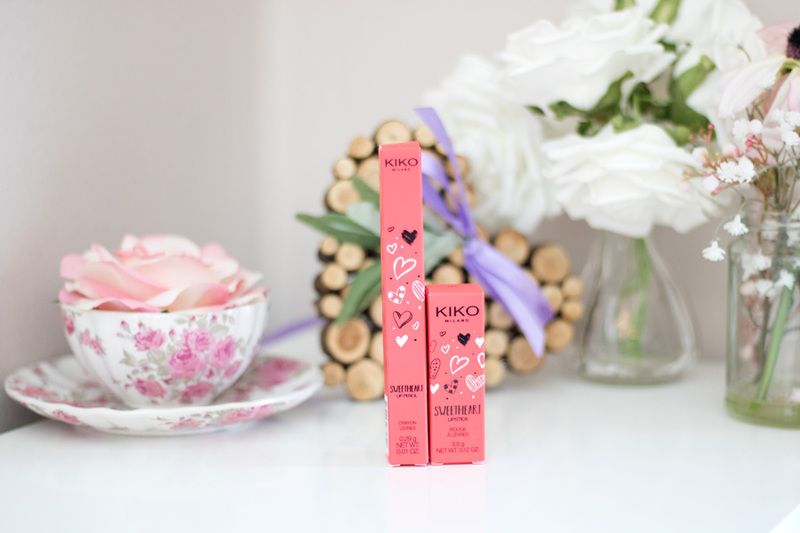 I don't use a lot of lip pencils these days but I was very curious about the KIKO Sweetheart Lip Pencil. It also comes in 6 shades similar to the lipstick and I got the shade Kiss from a Rose which is the matching shade to the lipstick. It is described as an automatic lip pencil in the sense that it rolls up and down. 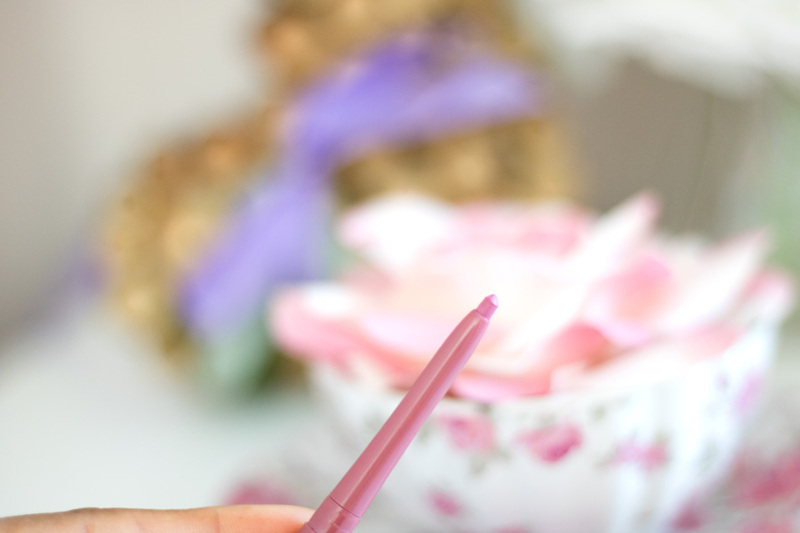 It does not need to be sharpened (hurray!!) and it's the perfect size for a lip pencil. 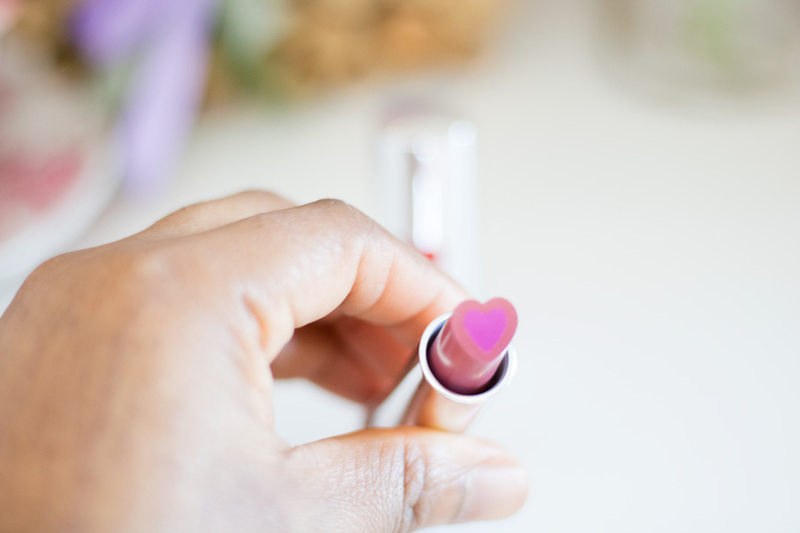 It fits the contours of my lips and I actually use it as an all over lip product. 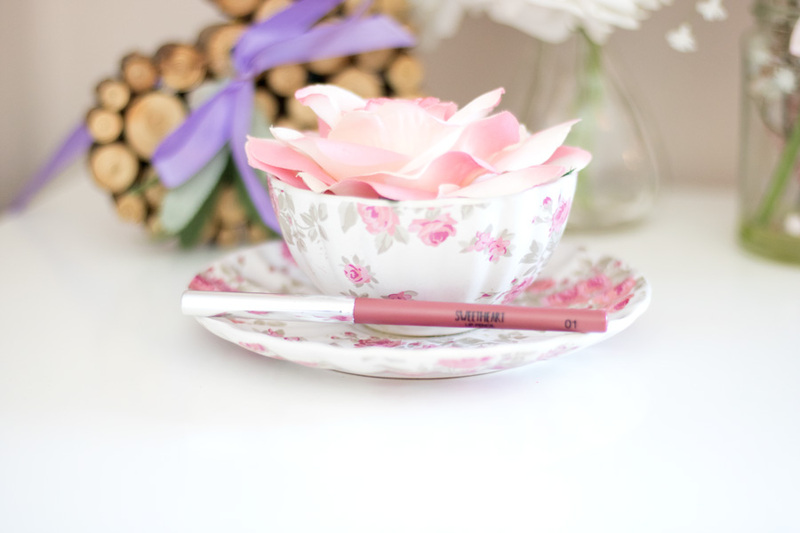 I have also used it as a lip pencil to go with the lipstick but I do prefer to use it all over my lips. 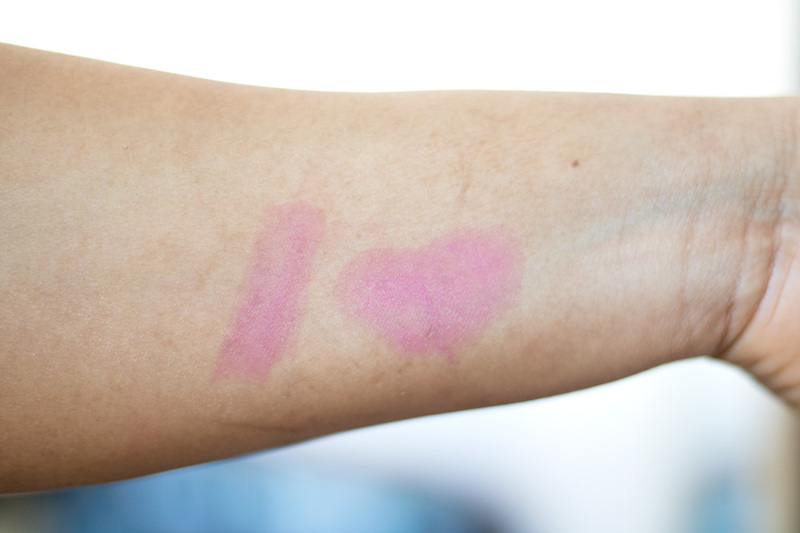 It is also well pigmented and moisturising on my lips. 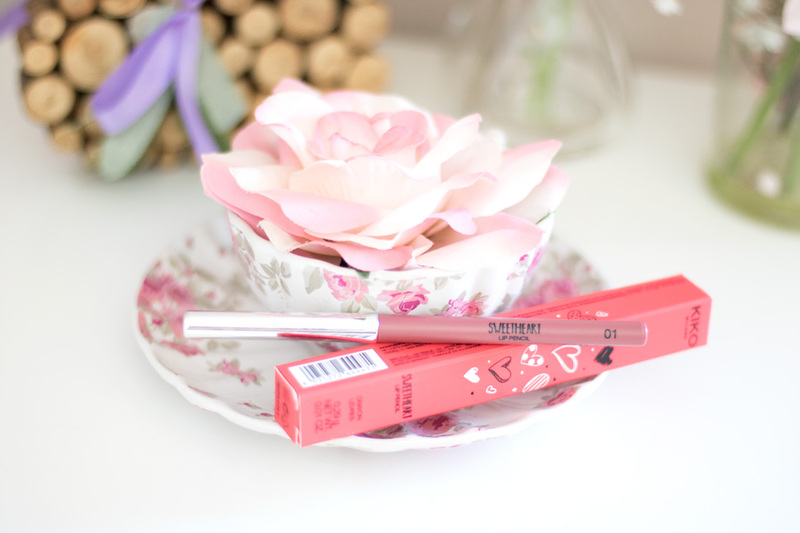 It does not break easily which is great because I have used lip pencils which break easily. Absolutely love using it!! 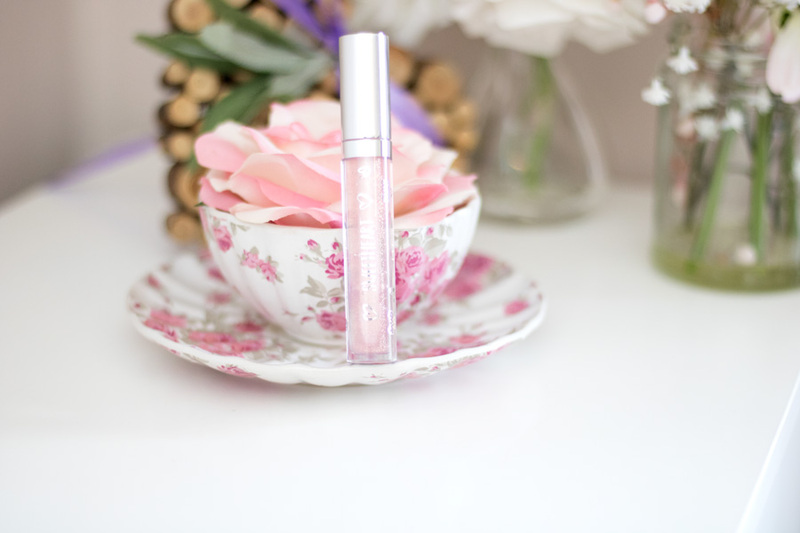 I rarely use lip gloss because I prefer either matte lipsticks or cream/shiny lipsticks. 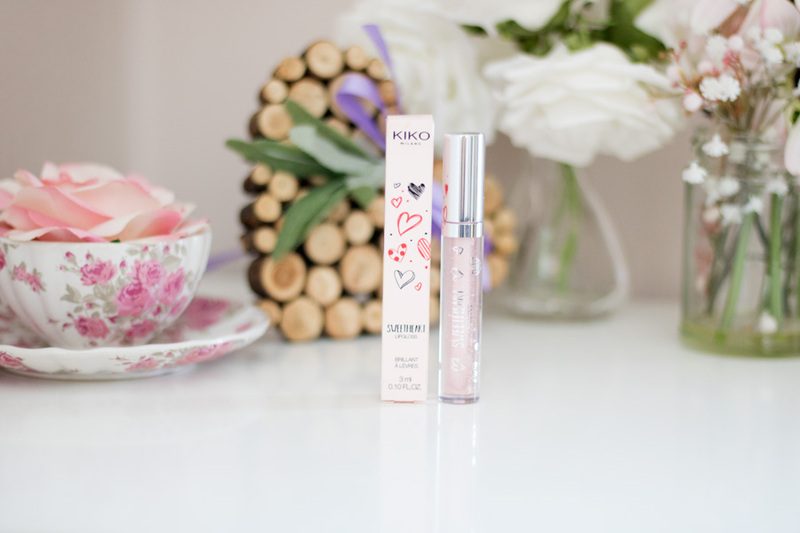 Every now and again, I try a few lip glosses but I always go back to my other favourite lip formulas. 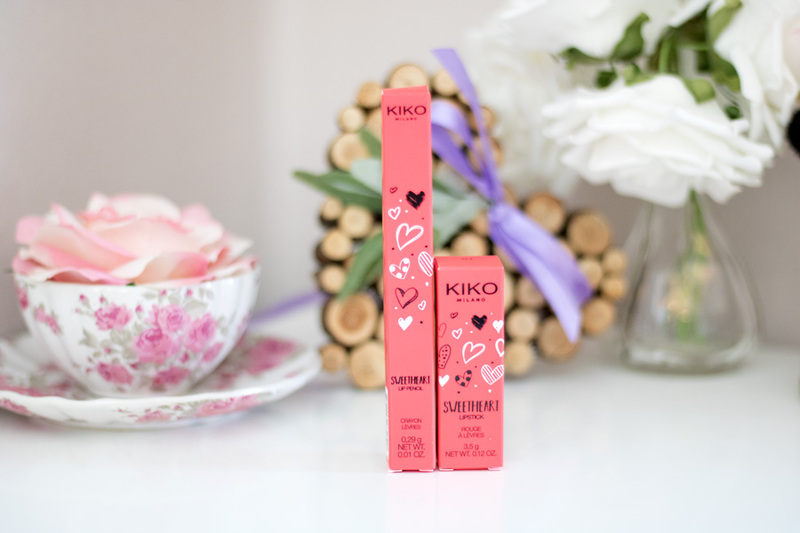 The KIKO Sweetheart Lip Gloss is described as a 3D-effect lip gloss which is lightweight. 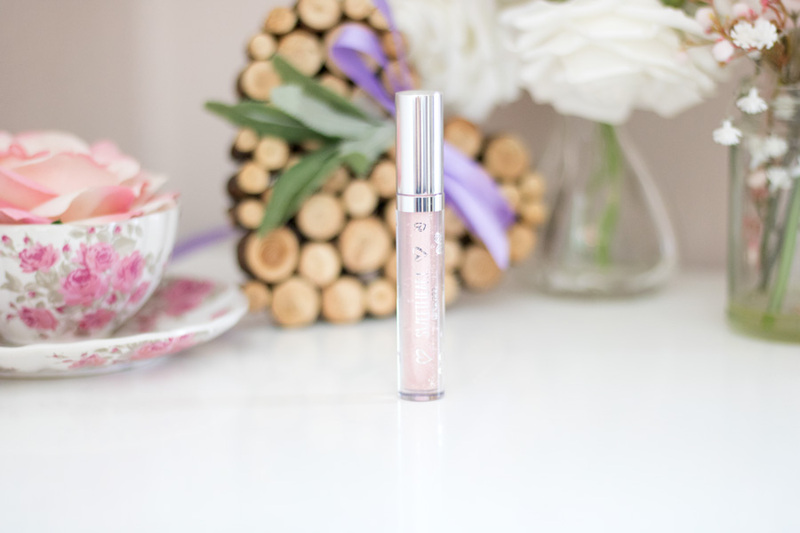 It has some light glitter which adds that extra oomph on its own or on top of another lip product. It does make my lips soft. I do find it slightly sticky on my lips but it's a gloss so I am not mad about that. For the cold weather, it is great to wear on top of my matte lipsticks which is always a plus for me. 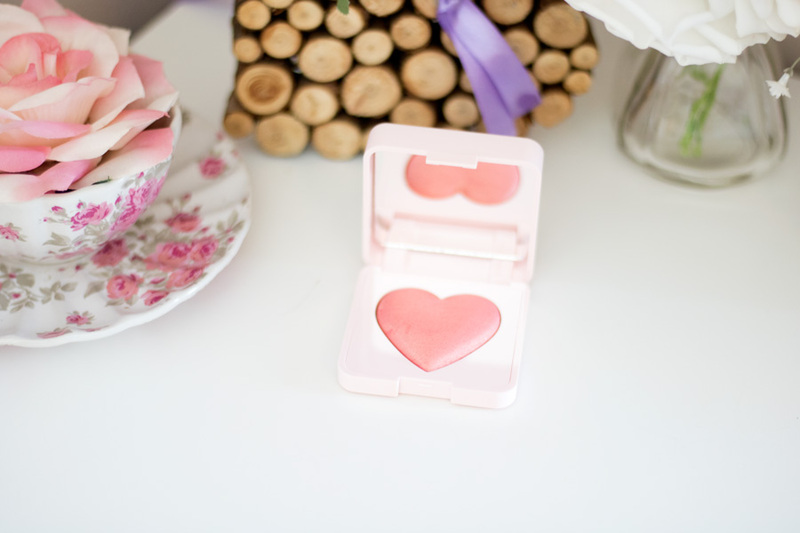 One thing I really love is the packaging and the applicator. It just looks so aesthetically pleasing; almost ethereal and it's possibly due to the design and the white colour. 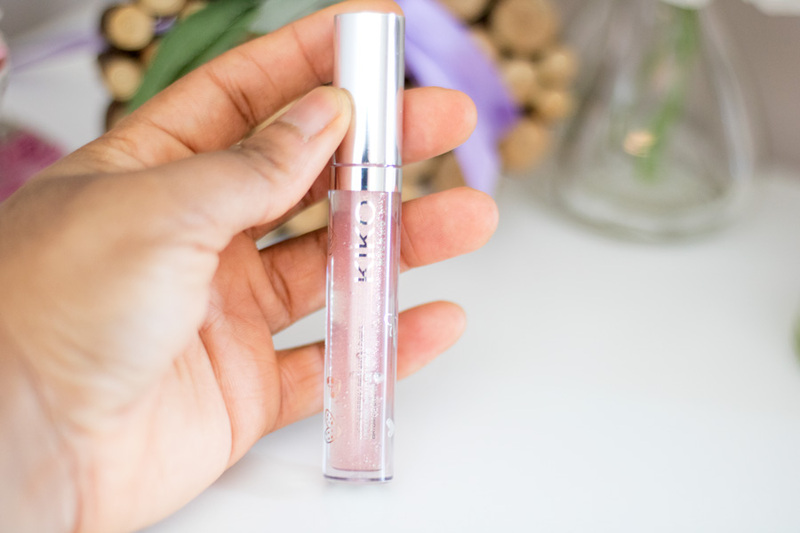 If you love lip gloss, I will definitely recommend giving this a try and it is very affordable as well. 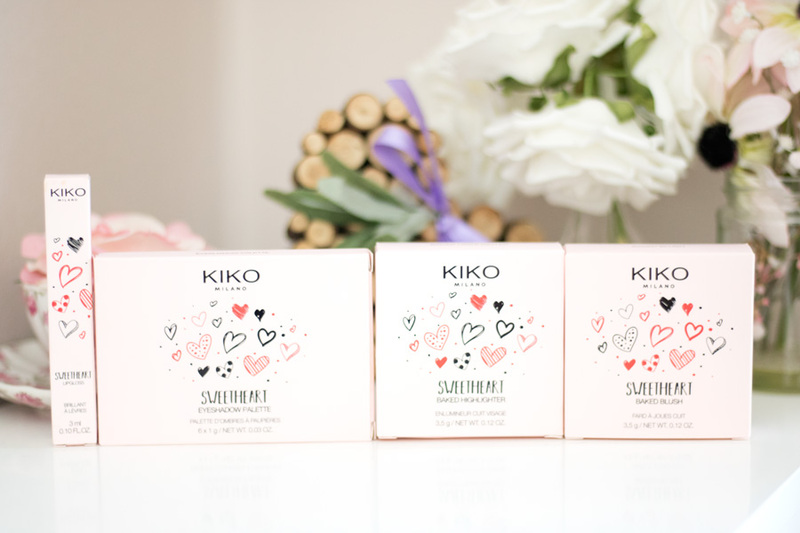 KIKO Sweetheart Collection can be purchased online (but the Baked Highlighter and Blush are sold out so only available in-store now). 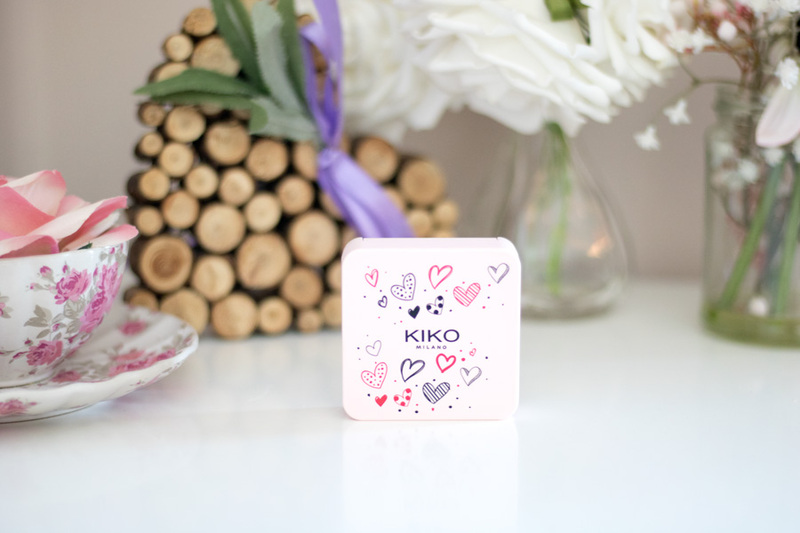 They can also be purchased from KIKO stores too which is always nice because you get to find other treasures in there. 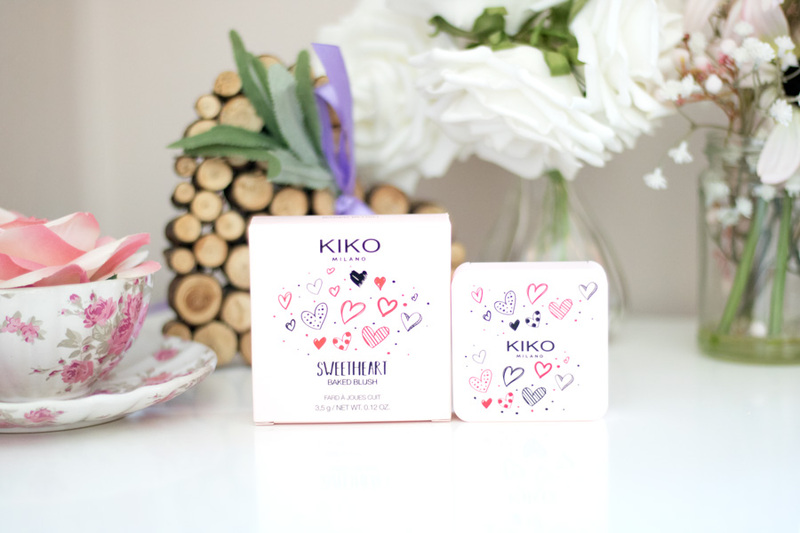 The best part is that they are offering a 25% discount off the Sweetheart Collection when you purchase 2 products from the Sweetheart Collection. It is only available online and will end on 14th February 2019. 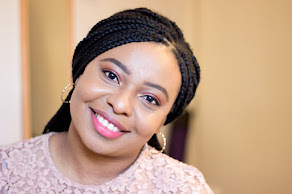 I really enjoyed trying out these products. 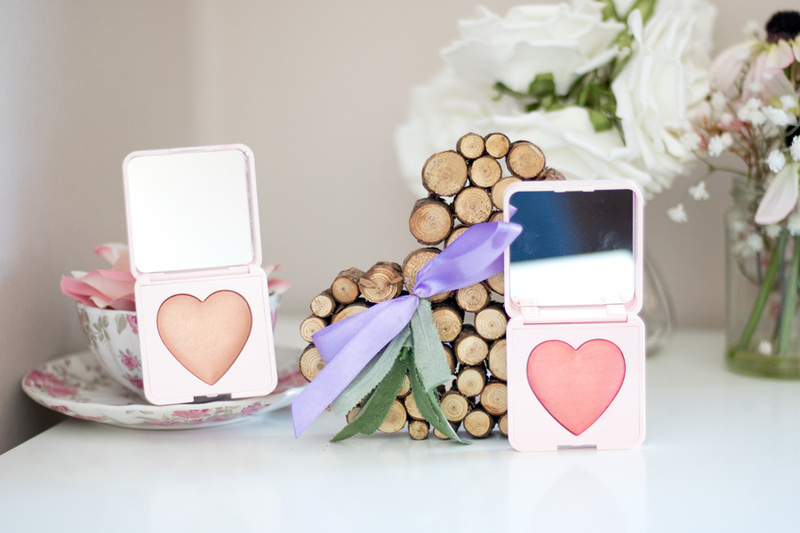 My favourite products from the collection are the Baked Highlighter, Baked Blush and the Two-Toned Lipstick. I will highly recommend checking them out. That's it from me. 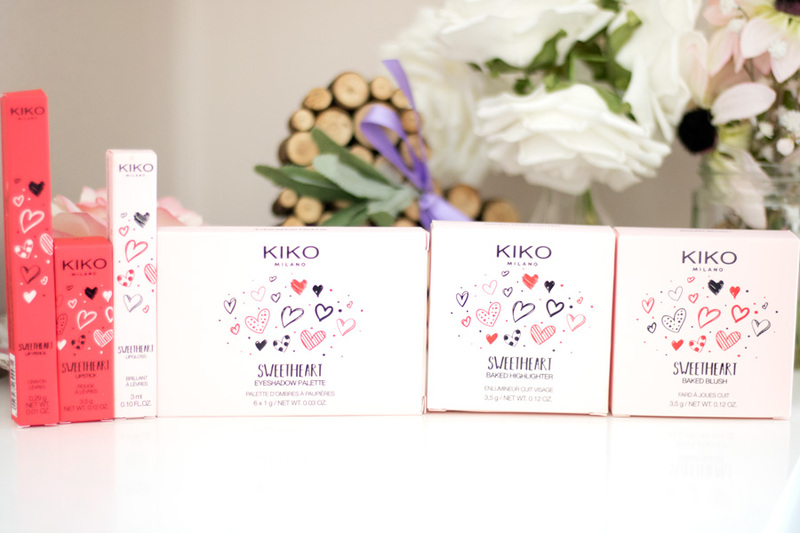 Have you tried the KIKO Sweetheart Collection?